Number 10 on the times list and post 5- The Magic Water Circuit or Parque de la Reserva in Lima. Above used links are from the Time article. Opening hours: The fountains are open Wednesday through Sunday, from 4 p.m. to 10 p.m. The park is a huge garden with fountains, train, a tunnel, art exhibitions and so forth. 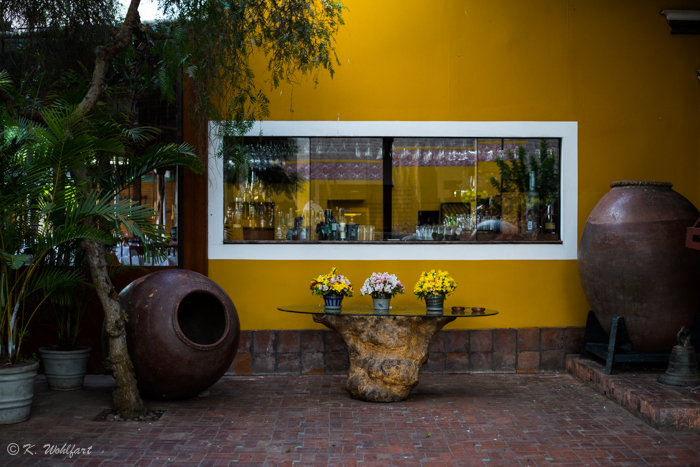 It is situated in downtown Lima, close to the tourism quarters. To get here you can walk, take the bus (the Metropolitano and jump of by the Estadio Nacional, the football stadium). It is next to the arena so there will be no problem finding the place. A good tip that Times give here is to go after the sun has set to see the water show. So did I. Tourists take photos of themselves and photos of other tourist taking photos. This is a fantastic opportunity for photographers. The water and the light in combination makes the possibilities for taking photos endless. I never understood where we where going since it was my boyfriends family who took me. Going again I would bring a tripod for long shutter-speeds as well as for filming. This i regret not doing today. Well, are any attractions that is based on materialism any environmental friendly? Not really. Sustainable on the other hand, can be answered in a yes or no, and here I am leaning at the no, due to the amount of water used in a desert city. All seems to be circling about water when it comes to Lima and this is also the case here. There is big amounts of water used, when there isn´t enough water for it´s inhabitants. But maybe, the enough water is more a matter of logistics that haven´t been solved yet, something that the government might be working at. But on the other hand, what is most important, something for the tourists or that every citizen that is living in Lima have water in their homes? A plus for this park is that there is a tunnel, that is called ”el tunel del rio hablador”, where information is given to the citizens of the importance of water and the situation in Peru, which feels like and is a good attempt to inform citizens and tourists of the situation. This is a big plus since a lot of tourist go here, get informed even though they never get to suffer from the lack of water but also inhabitants since the fee is no where near normal tourist prices which makes it possible even for locals. The light switched to different colors, making the whitebalace settings go all mad, but who doesn´t love AWB anyway? The show is a nice surprise where you get to see dances from all regions and other important aspects of the culture as the condor. Well, the show might change I might add but when I was there, (march/april 2014) the show was one of the highlights. I also caught it on film which could be viewed down below. When people travel to Peru they never have much time in Lima normally. Most tourist as I have come to understand, travel with a guided tour that have pre-set destination and where not much time is given to the city of Lima. If you only have a day, I would recommend the Historic center instead. This on the other hand is downtown, closer to where tourists normally live, so if you have time for more than one stop I would recommend this place. I will give the Magic Water Circuit a five star review due to the massiveness of water, art and information as well as the nice show, cheap price and overall availability. This is one of my top five Lima destinations. A little movie I made from the park and the show. (I realize that I need to practice on my filming and most important of all, bring my tripod the next time). Jag älskar vattenfontän. Men det finns inte många i Stockholm och nästan inget som är spektakulär. Sergelfontänen är avstängt, och även när den är i gång så är det bara vitt, på natten kunde den vara i olika färger. Och sen finns den ute vid Älvsjö mässan, men dit åker man inte i onödan. Nej. Och tänk dig en jättepark med minst 20-30 stycken!!! Fantastisk.. I mitt nästa liv ska jag dit. The video is great! Well done, Katarina! Well. A bit shaky biz.. 🙂 But thanks anyway.